¿Es realmente posible el cielo en la tierra? Tenemos acceso al mundo invisible del Espíritu y podemos traer a la tierra influencia celestial. Cuando recibimos al Espíritu de Dios en nuestra vida, descubrimos que sus dones son nuestra primogenitura. 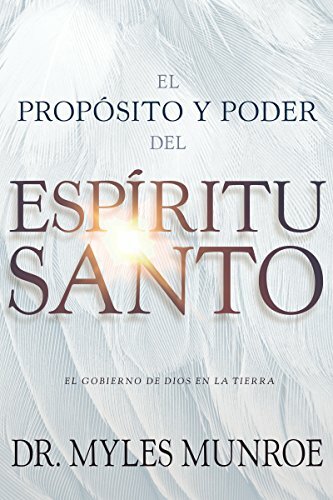 Reciba la plenitud del Espíritu de Dios y comience a vivir en el poder espiritual que Dios le ha prometido. “Os conviene que yo me vaya; porque si no me fuera, el Consolador no vendría a vosotros; mas si me fuere, os lo enviaré”. When we struggle with defeat and discouragement, the Holy Spirit is the key to victory and peace. Best-selling author Dr. Myles Munroe shows how to bring order to the chaos in your life, receive God’s power to heal and deliver, fulfill your true purpose with joy, be a leader in your sphere of influence, and be part of God’s government on earth. We have access to the unseen world of the Spirit and can bring heavenly influence to earth. When you receive God’s Spirit into your life, you will find that His gifts are your birthright. Receive the fullness of God’s Spirit and start living in the spiritual power that God has promised you. “It is to your advantage that I go away; for if I do not go away, the Helper will not come to you; but if I depart, I will send Him to you” (John 16:7 NKJV). If you have any questions about this product by Whitaker House, contact us by completing and submitting the form below. If you are looking for a specif part number, please include it with your message.